Usage Sorbic Acid is an naturally occurring organic compound first isolated from unripe berries. Sorbic acid has been used as a food preservative and as an inhibitor of Clostridium Botulinum bacteria in mea t products in order to reduce the amount of nitrites which produce carcinogenic nitroamines. General Description White powder or crystals. Melting point 134.5°C. Slightly acidic and astringent taste with a faint odor. Air & Water Reactions Soluble in hot water [Handbook of Chemistry and Physics]. May be sensitive to exposure to air and heat. The dust may become explosive, particularly when mixed with free-radical initiators or oxidizing agents. .
Reactivity Profile Sorbic acid may discolor on exposure to light. Can react with oxidizing agents. Also incompatible with bases and reducing agents. The dust may become explosive, particularly when mixed with free-radical initiators or oxidizing agents . 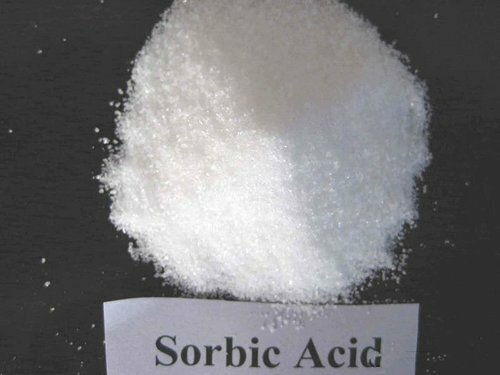 Fire Hazard Sorbic acid is combustible. Backed by magnificent warehouse, we are capable of catering to the varied requirements of our valuable customers. At our workspace, we have installed several machines and tools that help us with the obstruction-free operations that include storage and easy loading & un-loading. UAE, Bangladesh, Sri Lanka, Nepal and Nigeria are our major exporting countries. We have earned a strong position in the past decades and wish to continue with our name in the upcoming years as well. We import our products from China, Russia, Japan, USA etc.